This article was first published on VoxEU.org, on March 3rd, 2017. The recent waves of refugees in many European countries and the UK’s decision to leave the EU have directed the media and policymakers’ attention towards issues of migration and labour mobility. While there is an abundance of studies on the effect of immigrants on the labour market outcomes of natives (see the literature reviews by Longhi et al. 2005 and Lewis and Peri 2015), more recent papers have focused on how immigrants might affect firms, and in particular their productivity. Immigrant workers can affect firms’ productivity through several channels, two of which have been analysed in the literature. First, the specialisation of natives and immigrants in different and complementary tasks may increase production efficiency and labour productivity of firms (Peri and Sparber 2009). Second, as immigrants are often selected from among the highly skilled and educated, they may disproportionately contribute to innovation and economic growth within a region or a city (Kerr and Lincoln 2010, Peri et al. 2015). There is, however, scant direct evidence of the impact of immigrants on firms' productivity due to limited data and identification issues at the firm level. Our recent paper fills this gap in the literature by estimating the effect of an increase in immigrant worker supply across French provinces (départements) on firm-specific productivity (Mitaritonna et al. 2016). We use detailed, firm-level data (Enquête Annuelle d'Entreprise) and exhaustive information on the presence of immigrants across French provinces (from DADS)1 to show how firms react to a common local labour market shock in the supply of immigrant workers. During the period under consideration, 1995–2005, France experienced a significant increase in the foreign-born population (from about 6% of the population in 1995 to 12% in 2005), mainly driven by highly educated immigrants from other EU countries. Different regions had different exposure to immigrants (see Figure 1). Some (such as Champagne-Ardenne and Lorraine) did not experience much growth in immigrant supply in the sample period, while in others (e.g. Nord-Pas-de-Calais region) the share of the immigrant population increased substantially. Source: Authors on DADS data. Similarly, the employment of foreign-born workers varies substantially across French firms, but it increased, on average, over the sample period. In addition to the regional variation, however, firms within the same region (or province) employ very different shares of immigrant workers. This reveals a heterogeneous propensity to hire immigrants, for a given local supply, that may correspond to heterogeneous productivity effects of immigrants across firms. While the change in immigrant workers' supply over the sample period is common to a local labour market, different firms may respond differently. Hence, important outcomes such as productivity, capital investments, and exports may be heterogeneously affected. To reduce concerns of omitted variable bias, where unobserved local shocks may affect productivity and the supply of immigrants, we instrument the change in local supply of foreign workers with a so-called shift-share variable as proposed by Card (2001).2 This instrument leverages the pre-1995 distribution of old immigrants by nationality and the differential inflow of new immigrants by country of origin, considered exogenous to specific local demand. 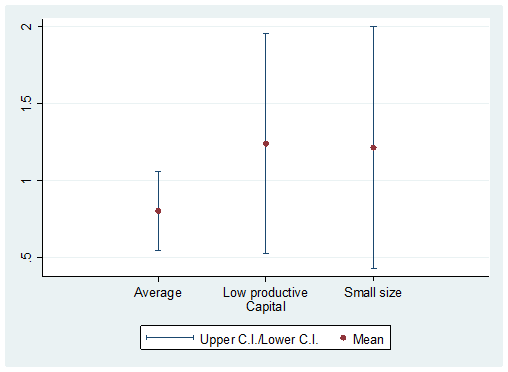 We test whether the impact of immigrants depends on firm's initial productivity (or size). If the hiring of new immigrants helps firms that are initially less productive (by cutting costs, through efficient specialisation), it would promote convergence in productivity across firms. Such productivity gain can also prevent firm exit and job destruction, and encourage growth. Thus, we analyse an array of outcomes at the firm level that might be affected by immigrants, including total factor productivity (TFP), the domestic market share, the logarithm of the capital stock, the probability of survival, the number of plants per firm, the logarithm of exports, and the average wage of natives in the firms. 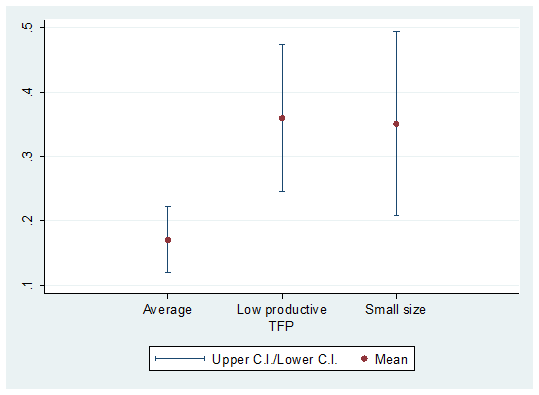 Results on the productivity effect of immigrants are synthesised in Figure 2, where the vertical axis reports the estimation coefficient (with upper and lower 95% confidential intervals) for TFP and domestic market share, respectively. A 10% increase in the supply of immigrant workers in the province implies 1.7 and 2.7 log-points increase in the TFP and in the domestic market share of the average firm, respectively. But firms’ heterogeneity matters – initially less productive and smaller firms benefit more from increases in the migrant labour supply. For firms with TFP initially below the median, a 10% increase in the local supply of immigrants implies increases of 3.6 and 8.2 log-points in TFP and domestic market share, respectively. Similarly, for firms with initial employment below the median, a 10% increase in the local supply of immigrants is associated with increases of 2.9 and 8.8 log-points in TFP and domestic market share, respectively. A possible consequence of the increased productivity and larger market share for a firm is the increased probability of survival. Consistently with this intuition we find that a 10% increase in immigrant supply in a province corresponds to a 6.7 percentage point reduction in the exit probability for the average firm (this effect is magnified for firms with initial employment level below the median) (see Table 8 in Mitaritonna et al. 2016). Source: Mitaritonna et al. (2016). We extend the analysis to other productivity-related firm outcomes (such as size, capital investment, and exports). Figure 3 shows the estimates on the capital intensity and total exports of firms. The results confirm the significant positive effect of increased immigrant supply, with a magnified effect for initially smaller and less productive firms. As a large part of the new immigrant inflows was made up of highly skilled workers (from other EU countries, following free mobility of workers within the EU), their hiring may have promoted complementarity with physical capital, boosting investment and the adoption of new technologies (e.g. Krusell et al. 2000). Consistent with this view, we find a strong growth in firms’ physical capital stock associated with larger inflows of immigrants. In particular, a 10% increase in the supply of immigrant workers increases the capital stock by eight log-points in the average firm, and by 12 log-points for small firms that were initially less productive. More productive firms are more likely to export, and they also export more. Thus, the productivity gains from immigration can translate into improved export performance. This effect is expected to be stronger for initially small and less productive firms that experience the highest productivity boost from immigration. Estimates of the (logarithm of the) total value of exports reported in Figure 3 show that a 10% increase in immigrants in a province increases the export sales of the average firm by 12.7 log-points. This effect, like those described above, is significantly stronger for small firms with low initial productivity. Source: Mitaritonna et al (2016). Finally, higher productivity, higher investment in physical capital, and lower exit probability should help native workers in affected firms. While immigrants may in part compete with natives for jobs, the effects described above will help existing workers, especially those in initially less-productive firms. Using the same empirical strategy, we show that an increase in the immigrant share in the province has a positive effect on the average wage of natives in the firm – a 10% increase in immigrants is associated with a five log-point increase in native wages in the average firm. 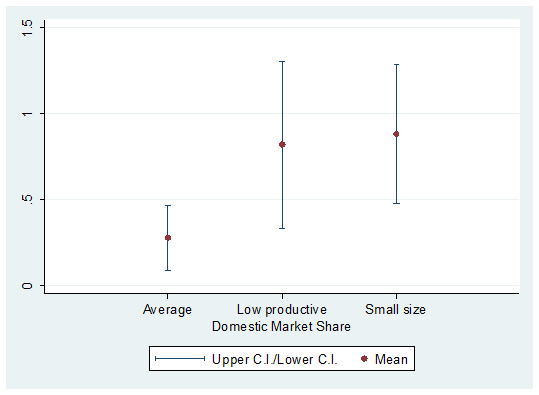 This effect is slightly smaller (but still positive) for firms with low initial productivity or small initial size. Mobility and selection of native workers across firms, in response to immigrants, may explain this result – while firms with initially low TFP attract highly skilled immigrants (who in turn increase their productivity), highly skilled native workers move to firms that do not hire immigrants (those with initially high TFP). This composition effect explains why the average wage of native workers increases more in firms with smaller increase in immigrant workers (i.e. initially less-productive firms). The mobility of highly skilled native workers towards firms that hire fewer immigrants may be an important channel of positive spillovers within a province. Firms that do not hire immigrants may experience part of the benefit via an increase in their set of skilled employees. Card, D (2001) "Immigrants inflows, native outflow, and the local labor market impacts of higher immigration", Journal of Labor Economics, 19(1): 22-64. Kerr, S P and W F Lincoln (2010) "The supply side of innovation: H-1B visa reform and the US ethnic invention", Journal of Labor Economics, 28(3): 473-508. Krusell P, L E Ohanian, J Rios-Rull and G L Violante (2000) "Capital-skill complementarity and inequality: A macroeconomic analysis", Econometrica, 68(5): 1029-1054. Lewis, E and G Peri (2015) “Immigration and the economy of cities and regions”, in G Duranton, J V Henderson and W C Strange (eds), Handbook of Regional and Urban Economics, Vol 5A: 625-685. Longhi S, P Nijkamp and J Poot (2005) "A meta-analytic assessment of the effect of immigration on wages", Journal of Economic Surveys, 19(3): 451-477, 07. Mitaritonna, C, G Orefice and G Peri (2016) "Immigration and firms' outcomes: Evidence from France", NBER, working paper 22852. Peri, G and C Sparber (2009) "Task specialization, immigration, and wages", American Economic Journal: Applied Economics, 1(3): 135-69. Peri G, K Shih and C Sparber (2015) "STEM workers, visas and productivity in US cities", Journal of Labor Economics, 33: S225-S255. DADS data are confidential data, acceded at CEPII, that consist of administrative files based on mandatory reports on employees' earnings and characteristics. The data contain yearly information about the structure of employment for each establishment in the private sector in France. Moreover, firm sector-period and region-period fixed effects are always included in the estimations. See Section 4 in Mitaritonna et al. (2016) for further details on our empirical strategy.